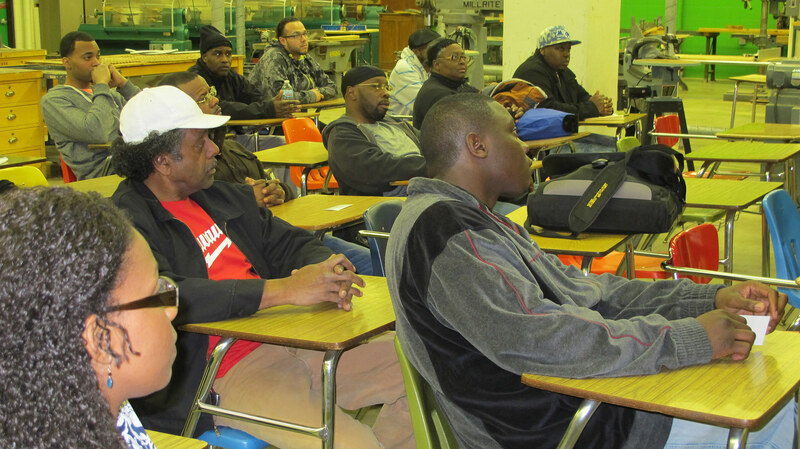 Ezzard White, founder of One Hope Made Strong (OHMS), is hoping to get approval to move his skilled trades education classes for adults back into a Milwaukee public school, but whether that happens or not, he said he will continue the program. “Even if I have to purchase a tent or go out on a lawn or in a park, I’m going to be teaching these students these skilled trades,” he said. Milwaukee Public Schools expelled OHMS from North Division High School in the middle of a term last June and White finished his spring/summer classes at two central city churches where he started the program in fall 2013. Like North Division, the Barack Obama School of Career and Technical Education (SCTE) has unused industrial technology labs that would give OHMS’ low-income adult students opportunities for hands-on learning. Program leaders are seeking an agreement to teach classes there. “We are talking with the right people,” said Pastor Theresa Thomas-Boyd, who explained that OHMS leaders had discussed the issue recently with an MPS regional superintendent. Thomas-Boyd is a co-pastor of Matters of the Heart Christian Ministries and a leader of the OHMS program. White said he and Thomas-Boyd met recently with Reginald Lawrence, MPS regional superintendent for the west region, about moving the program to the Obama School, at 5075 N. Sherman Blvd. in Sherman Park. MPS spokesman Tony Tagliavia said OHMS was asked to leave North Division because the contract White had signed with its after-school and adult education division, Milwaukee Recreation, was invalid. Tagliavia indicated that White was ineligible to enter into a contract with MPS. Wisconsin Court System records available online show that White has two felony convictions, in 1992 and 1993. White taught electricity, electronics and electrical math at Milwaukee Trade & Technical High School, now called Bradley Tech, and another MPS school for 12 years, before his 1992 conviction. Michael Bonds, president of the Milwaukee School Board, said the board revised its policy on criminal background screening last week. A copy of the new policy provided by the Office of Board Governance shows that the most significant change is the addition of an opportunity for a job candidate rejected as a result of a criminal conviction to file a written appeal with MPS’s Office of Human Capital. Driver said that the policy change was unrelated to White. According to Tagliavia, White applied as “Charles White” on an application form MPS uses for background checks. White signed his legal name, Ezzard Charles White, on the contract, prompting “a background check using the correct name,” Tagliavia wrote in an email. White said he might have inadvertently used his middle name, Charles, on the application, “but there was never any intent to hide my name. It’s all in the public record. Some people call me Charles and I sometimes use Charles with them.” He said a former student who works at Milwaukee Recreation calls him Charles. 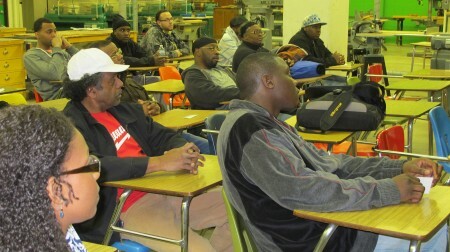 In late August, officials from the National League of Cities and My Brothers Keeper, a White House initiative to address opportunity gaps faced by young men of color, came to the Barack Obama School to hear about the OHMS program. 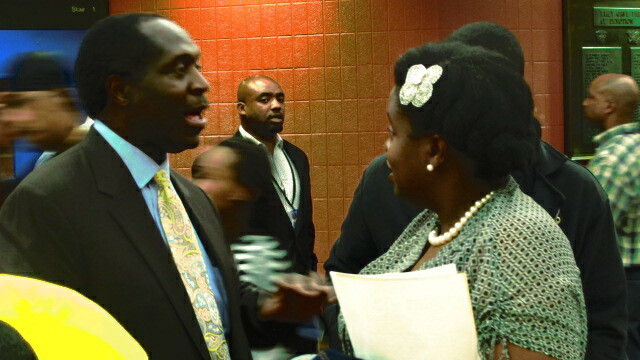 Principal Maurice Turner praised the program at that event. “(Turner) was 100 percent supportive of it,” White said. Despite repeated attempts, MPS would not allow Turner to speak to an NNS reporter. “It would not be appropriate to talk to the principal at this time about the program since no decision has been made regarding the program,” Tagliavia wrote in an email. White said he plans to resume classes at the program’s original location, St. Francis of Assisi Catholic Church, 1927 N. 4th St., next week, if he does not get the green light from MPS. He added that students have been calling him regularly asking when the program will start. About 275 are enrolled, according to White. OHMS student Mark Thomas said he has taken six of the nine modules and looks forward to completing the program in November. An unemployed welder, Thomas said he wants to broaden his skills in the hope of finding work. He added, “I will go wherever Mr. White goes” to finish the program.